One thing I’ve always tried to be mindful about is my kids. I’ve always tried to be present in and appreciative of each and every moment I have with them while they’re still young. This isn’t always easy, of course. Take when The Animal decided to use his head to obliterate the glass on our oven door (he’s fine; the door, not so much). Or when we had to forcefully shove a screaming Boogieface into her flower-girl dress, lest we be late for the wedding. Honestly, I didn’t feel so appreciative about being present in those particular moments. But by far I have thoroughly enjoyed and embraced the time I’ve been blessed to spend with my two little angels over the years. And as we slowly creep towards the dreaded Teenage Years — DUN-DUN-DUUUUN! — I find myself appreciating each moment more than ever. Swassie (pronounced Swah-see) is her beloved stuffed-animal friend — one of approximately 3,000 that she sleeps with nightly — that her brother bought her for her 11th birthday this year. 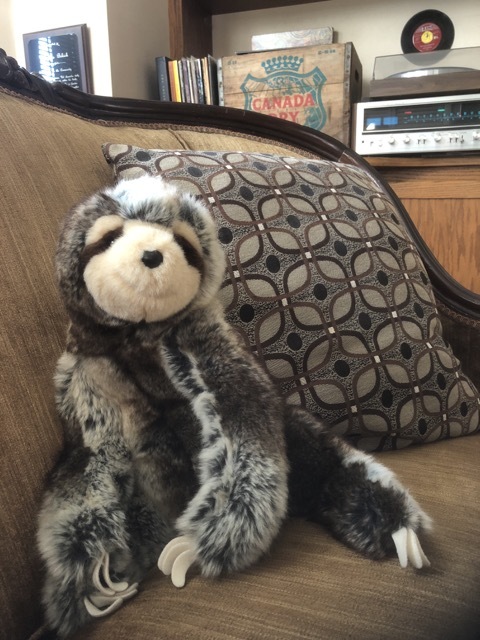 The sloth is actually my daughter’s spirit animal, seeing that they both move at right around the same speed, especially when we’re in a hurry to get somewhere or when I ask her to clean her room. Every morning Boogs comes downstairs cuddling Swassie, and right before leaving for school she tucks him in, all nice and cozy, inside a blanket on the couch until she returns later in the afternoon. This morning, however, she told me to make sure to cuddle her little friend from Down Under, and cautioned me that she’d know if I hadn’t if he was still in the same spot when she got home. First time I ever got threatened about cuddling a sloth. Now, I’m no fool (despite what you may have heard). I know this is just a little game my sweet baby girl is playing with her Daddy. She doesn’t actually believe that Swassie is real anymore than she believes that Bigfoot is real. (I’m still working on her with that one.) But every day, as I watch her grow a little taller, a little more beautiful, a little older, I am mindful that these days are fleeting. One day, not too long from now, Boogs will all but forget about Swassie and her other imaginary friends as she moves on to things like smartphones and makeup and — heaven help me — dating. Ugh. Then it will just be me cuddling Swassie in a corner somewhere, catching my tears in his fake but pleasingly soft tree-sloth fur, as I look back upon these magical, oh-so-fleeting days of fatherhood. So, yeah, I’m not afraid to say that I’ve already given Swassie a couple big hugs this morning. With the blinds closed, of course. I know you’d do the same thing if you were in my place.